We often lose ourselves in the rat race of the concrete jungle that we live in. We tend to spend all of our time in looking after hectic deadlines, work pressure and other such factors on a daily basis, which ultimately results in either loss of sense or utter saturation. If you've faced such situations in life, it is time you put everything down and head to the seclusion of Mother Nature. Luckily for the folks of Delhi, this is possible because Lansdowne, a quaint and mesmerising hill station of Uttarakhand, is situated about 260 km from the city. Since it is a cantonment area, Lansdowne is mostly looked after by the Indian Army. The town is named after Lord Lansdowne, the viceroy of the British Raj in 1887, who founded the place. The best time to visit this picturesque town is during the summer months of April to June, when the weather is perfectly balmy and pleasant. Established by Wazir Ghazi-ud-din in 1740 AD, Ghaziabad is an industrial city that is situated just 41 km from Delhi. It is called the Gateway of UP because of the city's closeness to Delhi. The city gets its name from its founder. Numerous temples, like Lakshmi Narayan Temple, ISKCON Temple, etc., are spread across the city that can be visited. Swarna Jayanti Park, Modi Nagar and Masuri are some of the places that should be visited in and around the city. Having found remnants from an era as long ago as Indus Valley Civilisation, Meerut is an ancient city of Uttar Pradesh that is located 64 km from Ghaziabad. The name Meerut might've been derived from what it was called in the epic Mahabharata as "Mayarashtra". You can visit places, like Jain temples in Hastinapur, Augarnath Mandir, Jama Masjid, etc., if you stop at this historic city. Formerly known as Hoh Dwar, which means gateway to the river Khoh, Kotdwar is a town of Uttarakhand that acts as a gateway to the Himalayan region. It is nestled on the foothills of the Shivaliks range and is at a height of 395 m.
The town is known for the Sidhbali Temple, which is dedicated to Lord Hanuman. Durga Devi Temple and Koteshwar Mahadev are some other temples that can be visited at Kotdwar. 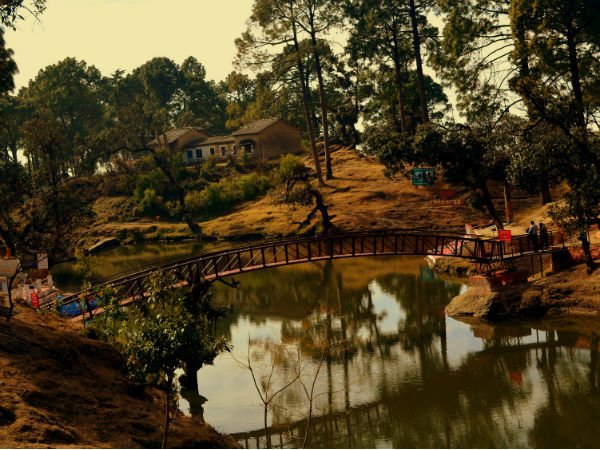 Read on to know about the places you need to visit in Lansdowne. Tourists and locals both love the Bhulla Lake since it makes for an ideal picnic spot. Since Lansdowne is a cantonment area, the lake is maintained by the Indian Army itself. With a balmy climate that adds a mystic aura to the lake, it is a good outing for the entire family. You may try boating in this scenic spot of Lansdowne. Tip n Top is a viewpoint which offers a breathtaking panoramic view of the entire town of Lansdowne, along with the magnificent Himalayan ranges. A trek to the top of a hill, which is about 2 km from the town centre, will get you to this point. Flanked with beautiful thickets of pine, cedar and other such stunning alpine trees, Tarakeshwar Mahadev Temple is one of the most holy sites to be visited for Hindu pilgrims. It is dedicated to Lord Shiva and remains particularly crowded during the festival of Mahashivratri. During the festival, the temple even offers dharamshala or accommodations to the devotees who come to witness the lord.